Laser eye surgery has produced hope for all diabetics who suffer from eye conditions as a result of their condition. Vision problems are a common side effect of diabetes and many diabetics will develop conditions that may lead to blindness or other sight problems. 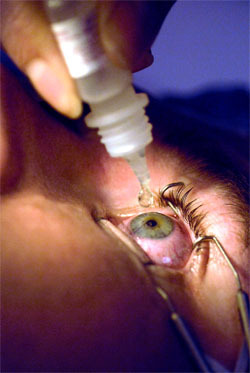 In the past, when patients were diagnosed at their annual eye examinations, many conditions could be treated medically, some could be treated surgically but others such as retinopathy, if they progressed beyond medical help, had no surgical options that could be offered to patients to reverse the symptoms of these conditions. What is Laser Eye Surgery for Diabetics? Most commonly used for conditions such as diabetic retinopathy, laser surgery is the perfect surgical intervention for any patients for whom there is an increased of risk of infection due to their medical condition. Laser surgery is now used in many surgical procedures and as it’s use has increased so has the ability of doctors to use it on a wide range of conditions requiring intricate surgery that could not be carried out using normal surgical practices. What Happens During Laser Eye Surgery for Diabetics? Laser surgery does not require an incision or stitches and for patients whose health is compromised by diabetes and for whom any surgery carries its own risks, this is a real benefit. Treatment is carried out by a trained ophthalmologist usually in an out-patient clinic of a hospital or in the doctors own offices in a treatment room. There is only minimal discomfort to some patients due to the need to keep the eye open during the procedure. The use of the laser helps to reverse and prevent the cause of the eye conditions (in the case of diabetic retinopathy this means the development of new tiny fragile blood vessels that easily rupture and bleed and this leads to vision loss. Laser therapy prevents the formation of these fragile vessels). Typically the treatment lasts approximately half an hour and during this time the patient remains awake and no anaesthetic is required. Most patients will require 3 or 4 treatments to ensure that the improvement in their eye sight continues. Simple and effective, patients experience improved vision almost immediately and potential for the development of future symptoms is significantly reduced. There are some risks involved in laser treatments for some conditions that may affect a diabetic and these will be discussed with patients when treatment is offered. These risks are associated with the diabetic condition and therefore not all eye conditions that may be treatable by laser surgery in non-diabetics can be treated in the same way with diabetic patients. Treatment for most conditions that may affect a diabetic are covered under the NHS, so anyone noticing their eyesight is deteriorating, even slightly should seek advice from their doctor or diabetes advisor who will refer them to an eye clinic for assessment and treatment. If a patient prefers a private consultation the cost can vary significantly with some clinics charging as much as £5,000 pounds for treatment (at the London Vision Clinic) and £1,000 (at Optimax). Patients should seek a referral from their diabetes medical advisor before choosing a private clinic.